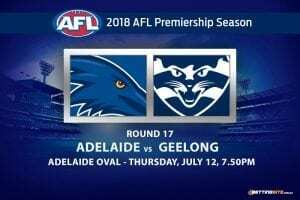 Geelong Cats: $7.00 – Has Geelong proven to be a good 2019 flag bet? 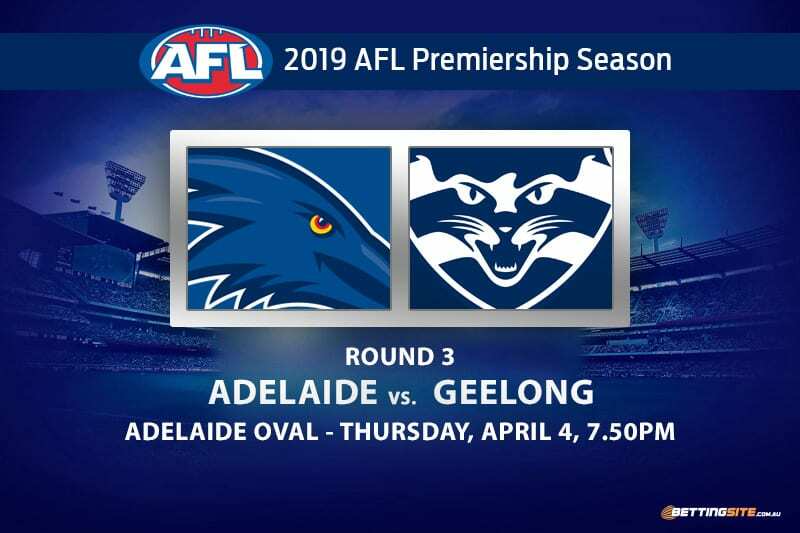 Geelong superstar Patrick Dangerfield will face his old team this Thursday night when the Cats make their way to Adelaide Oval to challenge the Crows. 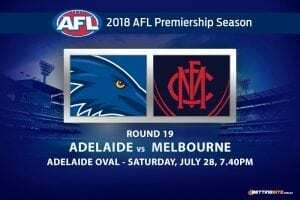 Adelaide and Geelong have become bitter rivals since Dangerfield made the big move from South Australia to the Cattery in 2015 and it’s Adelaide which has enjoyed the bulk of the success since, winning last three encounters, including the 2017 preliminary final. Geelong sits atop the AFL ladder after the first two rounds in 2019. A huge 80-point win over the Demons catapulted its percentage to 178.4. Although they looked shaky at times against the Swans, the Crows managed to win their round 2 match by 26 points. The Crouch brothers, Matt and Brad, have started this season on a strong note and will be a crucial component in this clash. 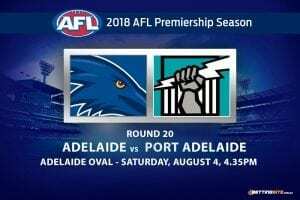 The Crows lost to the Hawks at home in round one and will welcome the opportunity to notch its first win at Adelaide Oval in 2019, while the Cats can lay serious claims on early finals aspirations with a third-straight win. Both sides may enter the match unchanged as no players are pushing for selection or have underperformed in their matches last week. Expect a quick contest with plenty of emotion. Here are our tips and predictions. Bryce Gibbs to Get 25 Disposals @ $1.80 – Is there a bonus available for this wager? The former number one draft pick has solidified his position in the Crows midfield and with more support from the Crouch brothers, should be even more damaging when he’s left off the chain. We expect Gibbs to rack up possessions and pose real problems for the Geelong defenders. Dangerfield played one of the great matches last weekend after finding the football 37 times, as well as kicking a pair of goals. The fast and powerful midfielder knows his ex-teammates well, enough to dominate this match right from the word go. When analysing both team’s recent performances, there has been a clear trend to low-scoring games. Only one match out of the four played between both sides has topped the 150-mark. We think that trend will continue here, especially if there’s some inclement weather about. 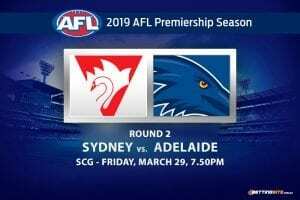 The Crows have the home field advantage and will use it wisely in this match. The revitalised Adelaide midfield will be the key to victory, as it was for the Crows against the Swans last week. 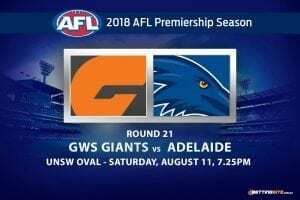 Line Betting: Adelaide Crows -4.5 @ $1.90 – Which bookie offers the best Adelaide odds? Geelong will have to relinquish its position atop the ladder as the Crows will knock off the undefeated Cats. 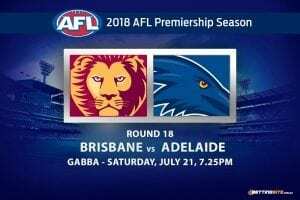 The Crouch brothers and Rory Sloane will beat the opposing midfield and provide ample opportunity for Adelaide to kick a winning score.